I never met my paternal grandfather because he died when my dad was only seven years old, so I have only heard stories about him from my grandmother when she was alive. She always spoke of him as being such a "fine man." Recently due to some family history put together by a first cousin and his daughter on Ancestry.com I have come to learn more. Between that and some photos and old typed as well as a hand written letter of recommendation I feel as though I am learning more about my grandfather. 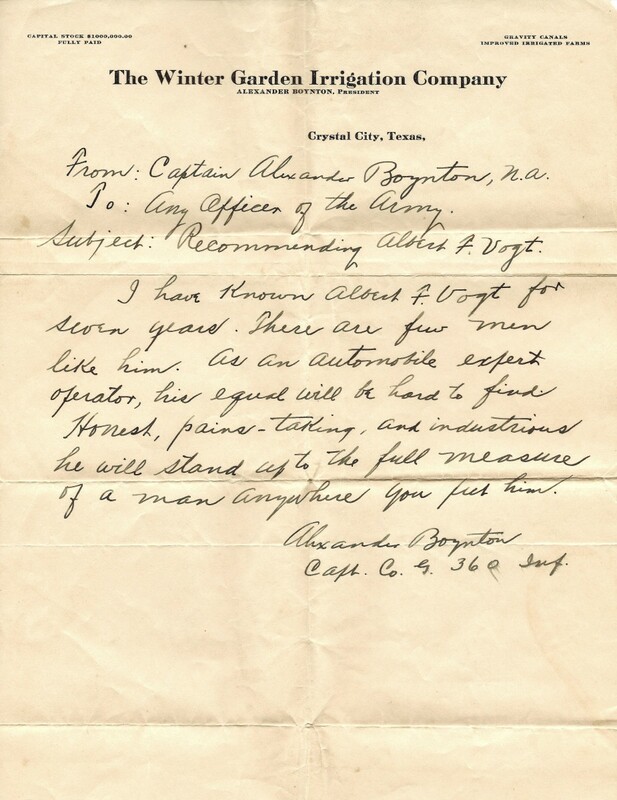 Previously I have written about some handwritten letters to my grandfather from a Mr. Howard Rogers. One was dated 1920 and the other, 1921. They were safely tucked away in an old cigar box and related to friendly discourse about crops and such in Frisco, Texas. But they also had references to shared experiences they both had in World War 1 on those early airplanes in the 50th Aero Squadron which is obviously where they met and from which time they maintained a friendship. The letters that will be shared here are earlier and pertain to what my grandfather had accomplished leading up to those days. 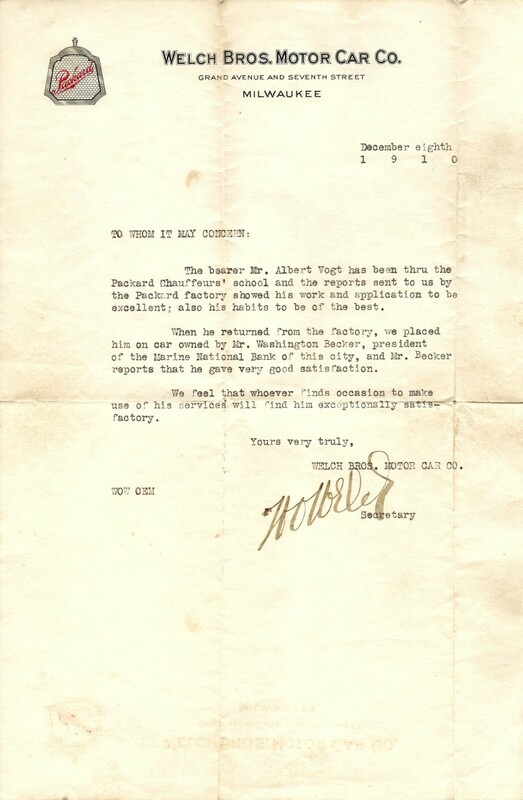 This first letter dated December eighth 1910 on Welch Bros. Motor Car Co. stationary also had a Packard emblem in the upper left corner, so obviously they were in some way affiliated with the luxury car manufacturer prior to selling out to the Packard Motor Car Company in November 4, 1911. 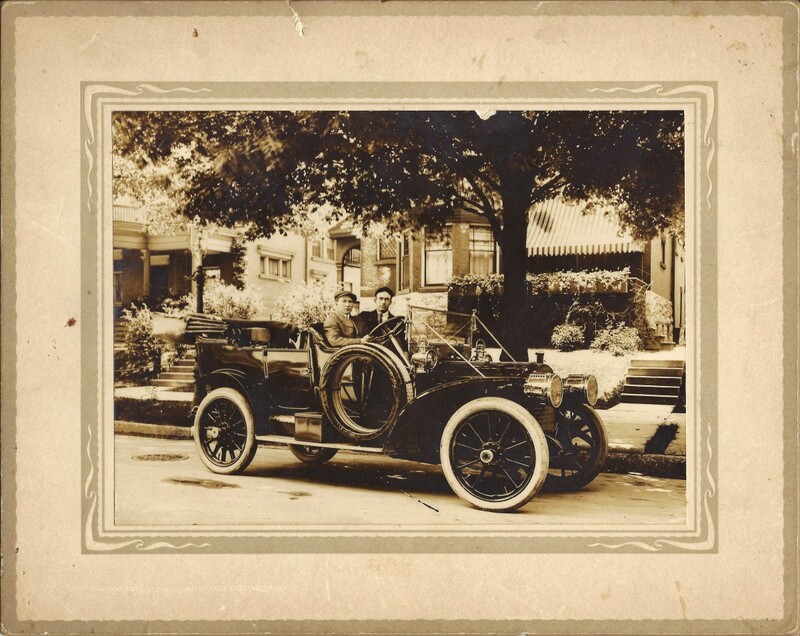 The first Packard vehicles were built in 1899. 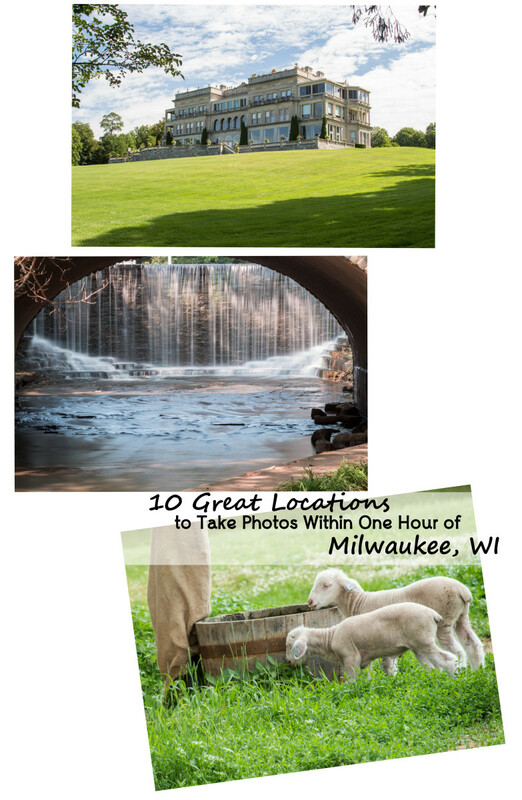 My grandfather grew up on a farm in Sullivan, Wisconsin. Whatever made him become interested in learning how to become a chauffeur I will probably never know for certain. Perhaps he liked tinkering with motors and engines? Perhaps he had some wanderlust? The first Model T Fords were just being produced late in the year 1908 and the Wright brothers first lifted a man off of the ground and successfully flew for a short time in their flying machine called an airplane in December of 1903. So these were times of change and big dreams of how people moved from one place to another. The entire world was about to transition from a slower paced society to one of more rapid developments in many ways yet unimagined. Horses and carts were to be replaced by these new "horseless carriages" and flying machines would have people traveling further and faster than previously possible in past years. These first two letters show that my grandfather went to Milwaukee which was about 30 miles or so from where he had been living and after learning what he did at the Packard factory (which was probably the one in Detroit, Michigan) he graduated from the Packard Chauffeurs's School in Milwaukee and successfully worked for Mr. Washington Becker, president of the Marine National Bank who then recommended his services as a trained and conscientious chauffeur. Chauffeurs were trained not only to be courteous and respectful to their employers; be proficient with their driving skills, but they also had to keep the luxury automobiles in tip top shape which is where the mechanic training would have come into play. Obviously only the wealthy people back in that day and age could afford chauffeurs which would have been a full time job for the chauffeur. Today there are many companies that offer chauffeur driven limousines or other vehicles that can be hired just for special occasions. 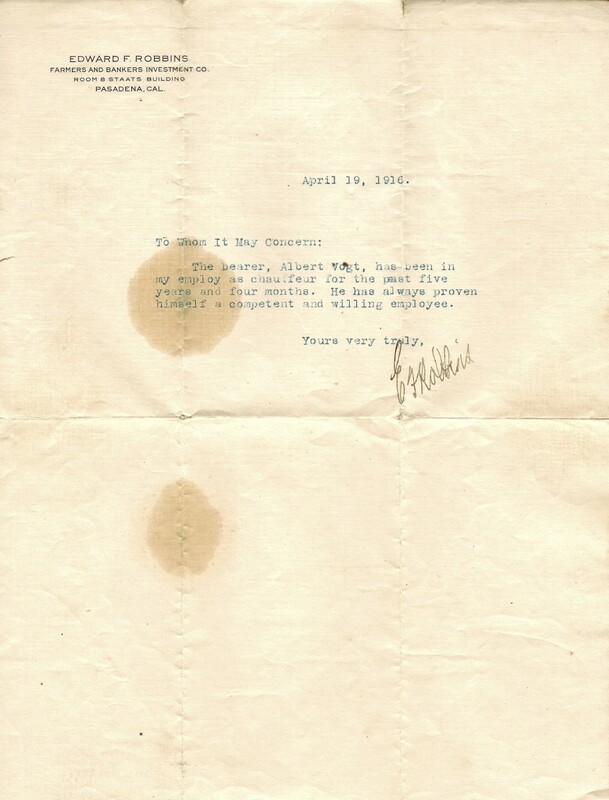 Judging from the timeline of these letters and the recorded memories of my grandmother, my grandfather took his first chauffeur job (after his training and evaluation period) in Pasadena, California and worked for a Mr. Edward F. Robbins for over five years. He loved to dance and did some dancing as a background character in some movies and earned a little money doing that. But apparently he earned enough money as a chauffeur that he had a home built in Pasadena which he later sold after marrying my grandmother to fund the building of their home on Okauchee Lake in Wisconsin as well as a string of cottages as an income investment. Let me just say that I am not a car aficionado and do not know that much about cars. If I cannot read the name of a car from an insignia attached to the outside, I rarely know the name of the cars on the streets today with few exceptions. That was not always the case. When I was a child and my family would be taking road trips, one of our games was to identify the type of cars on the road. 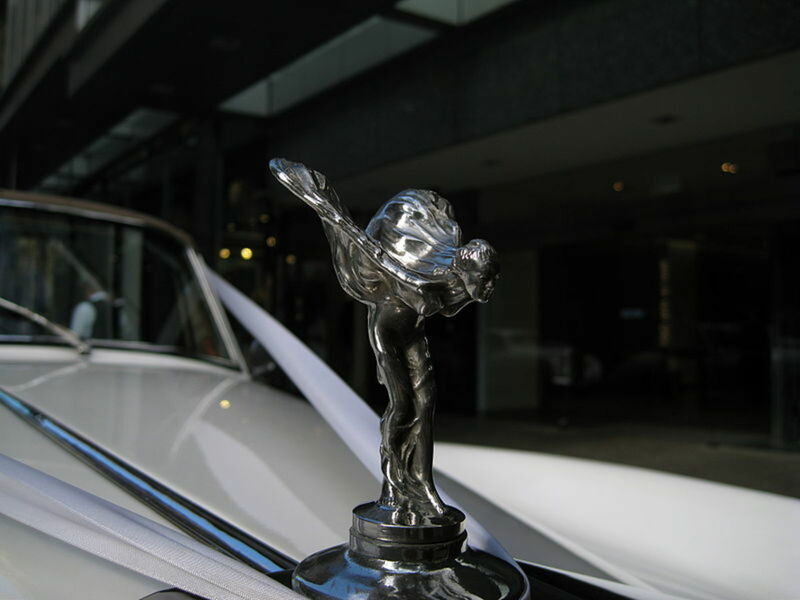 There were not that many different kinds back then and they had distinctive body styles and hood ornaments which identified them as to the car maker. Seeing how many license plates from different states we could identify was another game. Even if there were radios in the cars, reception was not always good so we would talk, sing and interact with each other in these and other ways. 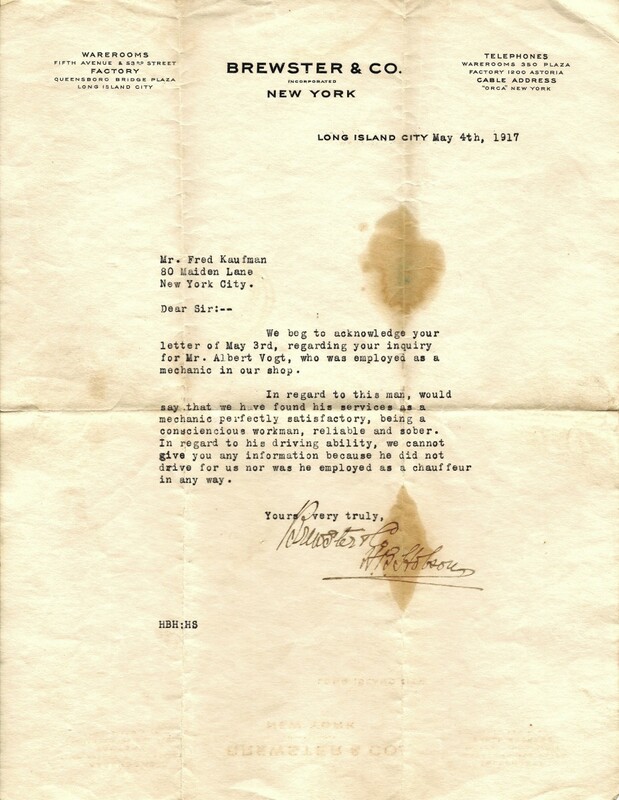 Thus seeing these next letters of reference on Brewster & Co. letterheads and learning about this high end automobile manufacturer in New York was an education for me. Apparently my grandfather wished to enlarge his body of knowledge and worked as a mechanic learning even more than previously taught from the Packard school. The most prestigious French car of the time was the Delaunay-Belleville which was imported by Brewster & Co. in 1905. They were also the sales agent in the United States for Rolls Royce and produced their own luxury car known as the Brewster Knight by 1915. The auto plant producing these rare and expensive cars was located in Long Island City and that was my grandfather's next destination. People like the Vanderbilt's, Astor's and others even had their own special colors when their Brewster cars were produced and no one else could have the same color. 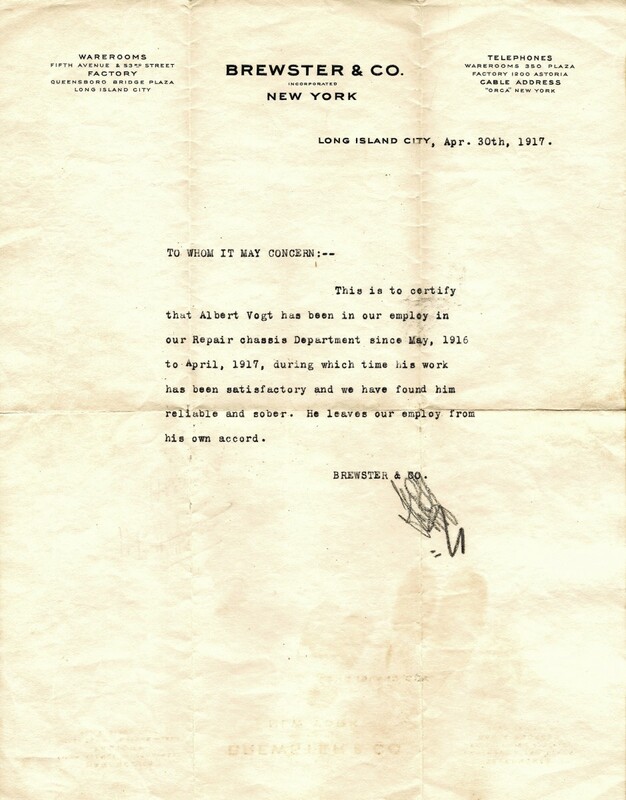 The next letters of reference refer to the work that my grandfather did while working at Brewster & Co.
After his time spent learning the mechanics of these luxury cars worked on at Brewster & Co. my grandfather once again worked as a chauffeur in New York City for around a year and a half for Mr. J.H. 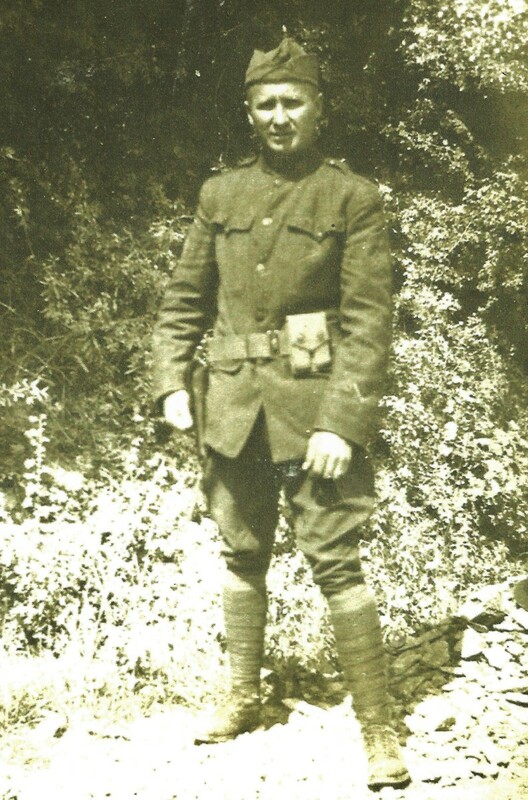 Eagle prior to enlisting as a soldier for World War 1. The person for whom my grandfather worked as a personal chauffeur was J.H. Eagle. J.H. Eagle and his brother, C.K. Eagle built and operated silk mills. They had facilities in six different places but had their main office in New York. The raw silk was purchased in Asia, shipped to the United States where it was dyed and spun into thread and where the weaving took place. When World War 1 broke out, my grandfather along with many other patriotic men joined the war effort. He became affiliated with the 50th Aero Squadron and became responsible for keeping those early biplanes functioning and air worthy. Obviously according to this next letter, Mr. J.H. Eagle would have welcomed him back to work for him once again as a chauffeur after my grandfather's war service was ended. 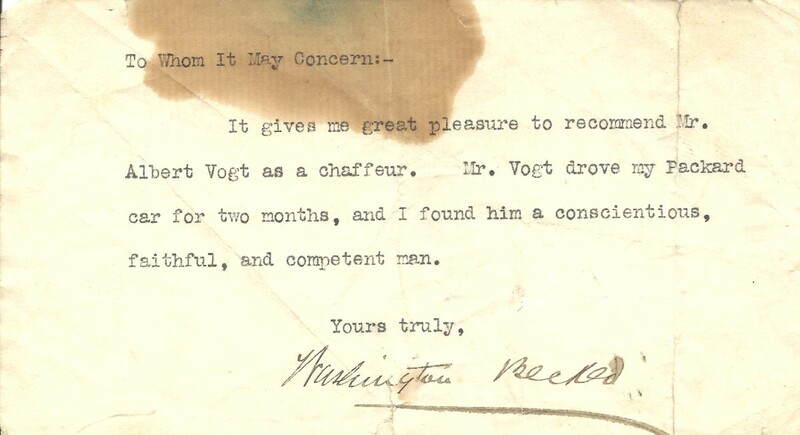 This last letter also refers to my grandfather's expertise with regard to automobile engines which also (obviously) translated to knowing about those early airplane engines since that is the area in which he served during the first World War. It is not dated and I do not know how or why my grandfather would have known the president of this company from Crystal City, Texas and for a seven year duration of time. Mr. J.H. 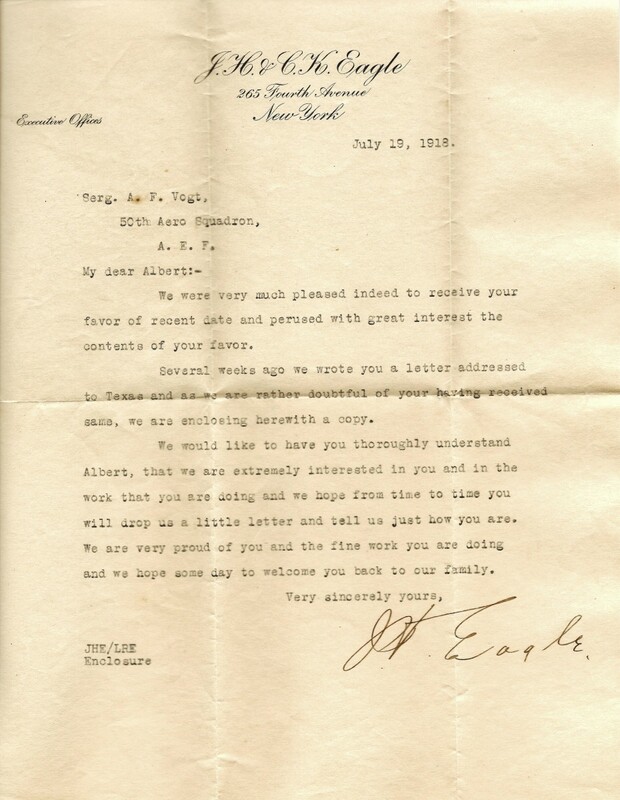 Eagle's letter makes reference to sending a letter to Texas. Perhaps he did some basic training in Texas? According to my grandmother, my grandfather knew Charles Lindbergh. 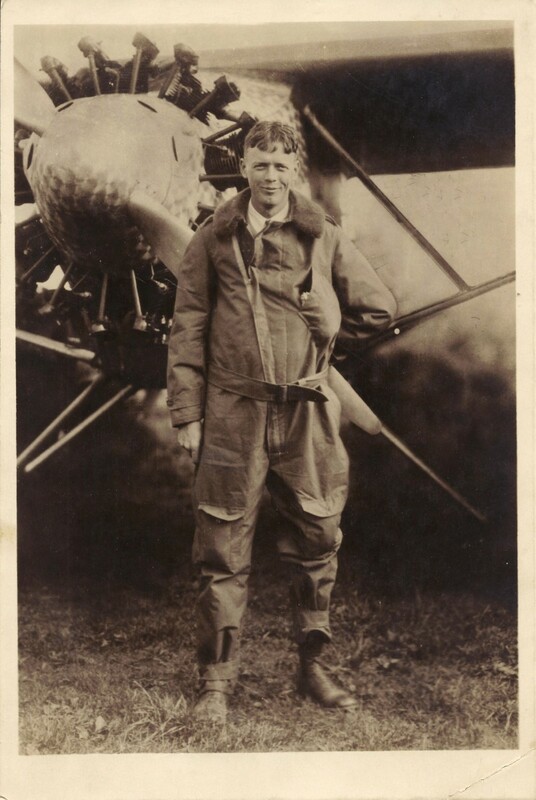 This photo of Charles Lindbergh was given to my grandfather. When my grandmother was still alive I unfortunately never asked her how or why this connection had been made. Obviously both men were interested in motors and the early days of flight. Of course Charles Lindbergh became instantly famous worldwide when he completed the first solo trans-Atlantic non-stop flight in his airplane named the Spirit of St. Louis when he piloted the plane from an airfield in Long Island New York to Paris, France in May of 1927. After the war my grandfather returned to his hometown of Okauchee and got engaged and later married my grandmother. They had been corresponding with one another for many years. I found this journey looking through these old letters and photos interesting not only because of learning more about my grandfather whom I never got to meet as he died when my dad was still a child but also for their historical references to some of those early luxury cars and the people whom my grandfather got to meet along the way. I was fortunate to have learned as much about him as I did from my grandmother. Finding these letters just added more information. You are correct in that hard working people back then had a good and honest work ethic. Thanks for your comment. Being able to document some of your family history with this info and photos is so neat, and to have others connecting with you because their ancestors recognize your grandfather from their own photos is amazing. There will always be questions we wish we could have asked, but to have this much is wonderful. Their generation was marked for a willingness to work hard (and honestly) to achieve what only patience could give them. Old letters kept like this certainly do make it easy to do some delving into family history. My grandmother always said that my grandfather was "such a fine man." Those were her exact words. It was a shame that he died at such an early age. Thanks for your comment. You've done a good job tracing your grandfather's activities. Quite interesting. That would be wonderful! What was your grandfather's name and where did he live? Do you have an email address that you would care to share? Our grandfathers were in the 50th Aero Squadron together. I have a few photos with Albert Vogt in them. I'd love to share with you. Yes history does come alive when it can be connected with people we know or more particularly those from our own families. So glad you liked this and thanks for the pin. How lucky you are to have all these letters and photos, and they are fantastic! I especially like the photos. History is so much more interesting when you can connect it to someone you know who actually lived it. Voted up, AUI, pinned to my 'Fun & Interesting' board, and will share with followers. I wish my grandfather could have lived longer. It would have been so interesting getting to know him in person. He was an intelligent, self-motivated and industrious person from all reports and accomplished much in his short life. Glad you liked reading this. Beautiful and precious memories, pictures and documents. What a fine tribute and read. Voted up and beautiful. Pinned as well. I thought that you would be interested if you tumbled onto reading this hub since you have written about the importance of knowing how to write a letter of recommendation. Thanks for your votes and the share. My family background is 3/4 German and 1/4 Norwegian. Glad you liked these old family photos. It would have been nice if I could have gotten to know my paternal grandfather. Thanks for your comment. Very interesting Peggy, they look eastern-european, what part of Europe does your family hail from? Glad that you enjoyed this hub about the Packard Chauffeur school and the part my grandfather played when it came to those World War 1 airplanes. Thanks for leaving a comment. I have no idea. I never heard from my grandmother that my grandfather had met Rickenbacker and now, sadly, I do not know anyone that could accurately answer that question. But it could certainly have been a possibility. Thanks for your comment. 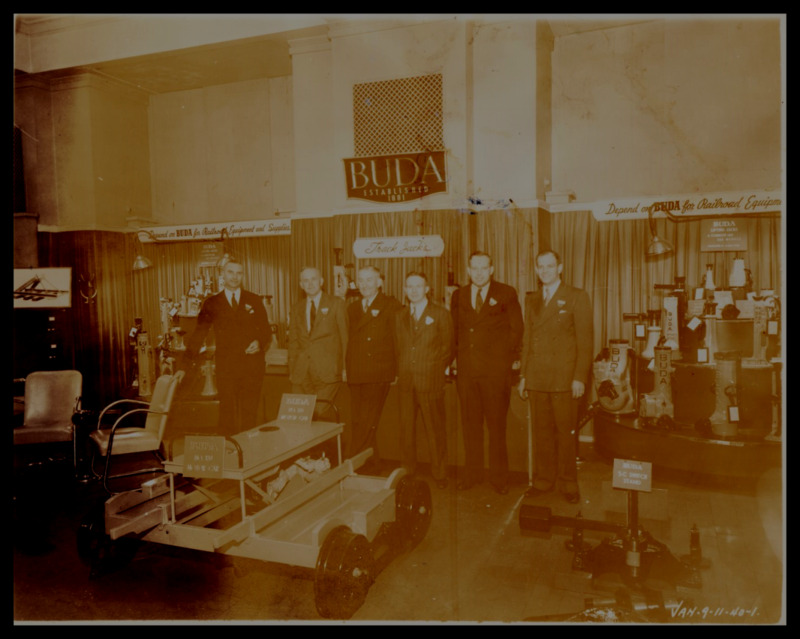 With their common background in cars and "aeroplanes", have you checked into whether your grandfather might have known race car driver, American ace and later Eastern Airlines owner Eddie Rickenbacker? 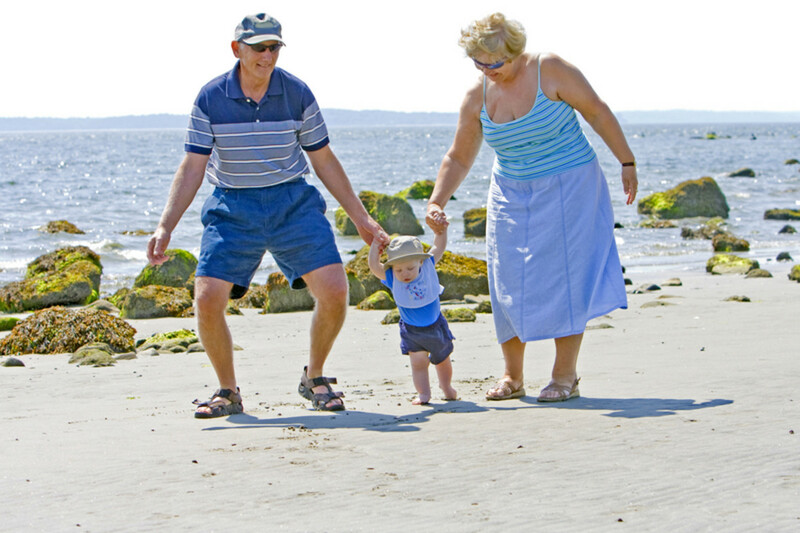 With or without pictures, it sounds as though your family experiences would be interesting to relate. As far as my grandfather and his connection with the Packard Chauffeur school and going on to the WW1 airplanes, etc., this has been interesting to share with family members who did not know all of these details...especially the ones interested in family history. Thanks for your comment. Wow, such a factual hub, I envy the actual pictures I wish could have historical pictures of my grandparents...I only have the story, not the pictures due to our "nomadic life" as a missionary family. This is a perfect hub to trace family roots...Pefectly done hub. Thanks for sharing. I never got to meet this grandfather but fortunately grew up hearing about him and had these things passed on down to me. My other grandfather I knew well and lived nearby. Thanks for your comment and SHARE. You are so lucky to have these remembrances of your grandfather, having to do with technology no less. I have nothing at all from either of my grandfathers. Voting this Up and Interesting. Thanks for SHARING. Hi, Peggy, I have often wondered whether to write about my mum, I may write her funny stories of being in the waafs she had some really good stories to tell, thanks I may well do that, I will have to think which ones to do, thanks! Have you written about your mom being in the RAF during the 2nd world war? That would be interesting to read as it was not yet that common for women to be involved in war. Thanks for your interest in this hub regarding my grandfather and how it lead to his part in the first world war. My grandfather was not a pilot but was responsible for keeping those first airplanes air worthy and he did get to fly in them as a passenger...what would now probably be referred to as a crew chief. Thanks for your interest in the early days of flight and also the first luxury automobiles. Appreciate your comment. It sounds awesome to have a grandfather who was a great chauffeur and has the letters to prove it, AND who flew the first warplanes. It's always interesting to learn about the past and when our elders were younger. You have added valuable information to what I had learned from these old letters and photos related to my grandfather's early days. Amazing to me that auto mechanics were responsible for keeping those early airplanes air worthy. Guess it makes sense since the motor mechanics were probably similar. Appreciate your coming back and wishing you further good luck with your research. 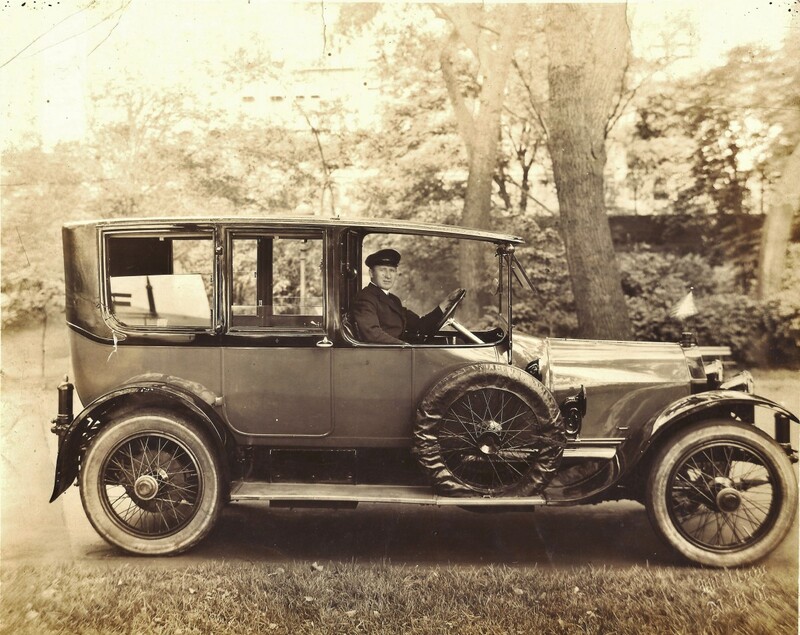 The first automobile looks like a 1909 Packard Model 18. The hubcaps, lights, and front fenders give it away. 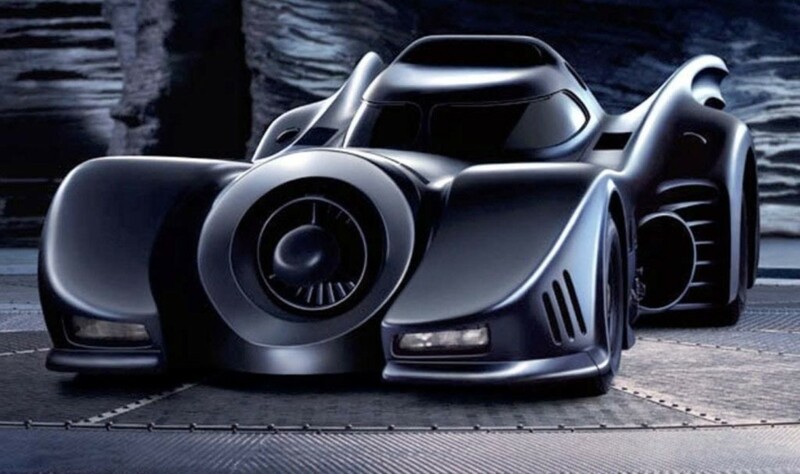 You can find photos of a car like this one online by typing the info I mentioned in your search engine. 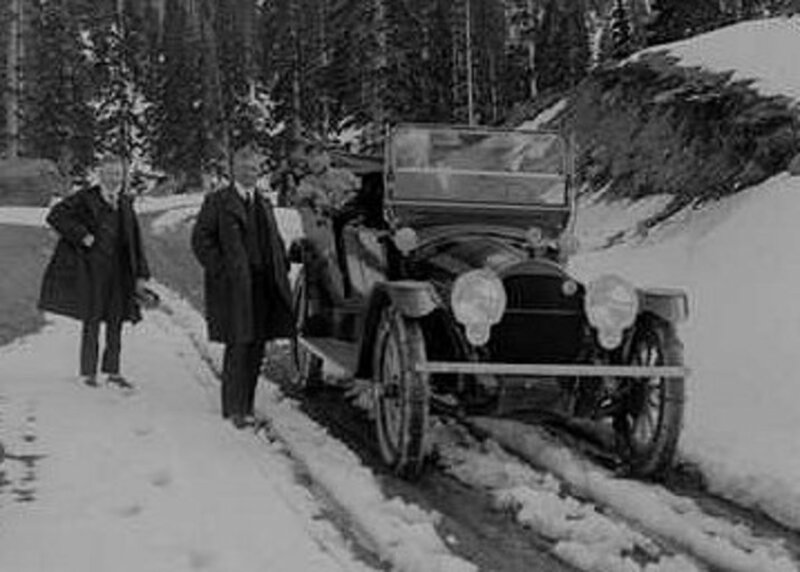 I did learn that we are not able to pin down the exact Simplex your grandfather is driving in the other photo, but the license plate number for Mr. Eagle's Simplex in 1913 was 14923. In 1914, that same car had a New York license plate with 20987. The pictures are super and I've saved them for the work I'm doing on Brewster and company. If I come across your grandfather's name in any of the journals, I will forward that info to you. That is so nice of you to inform us of the exact model car that my grandfather was driving in that second photo. My cousins will also be interested in learning that the Eagle brothers also owned these Simplex automobiles back in 1913 and 1914. 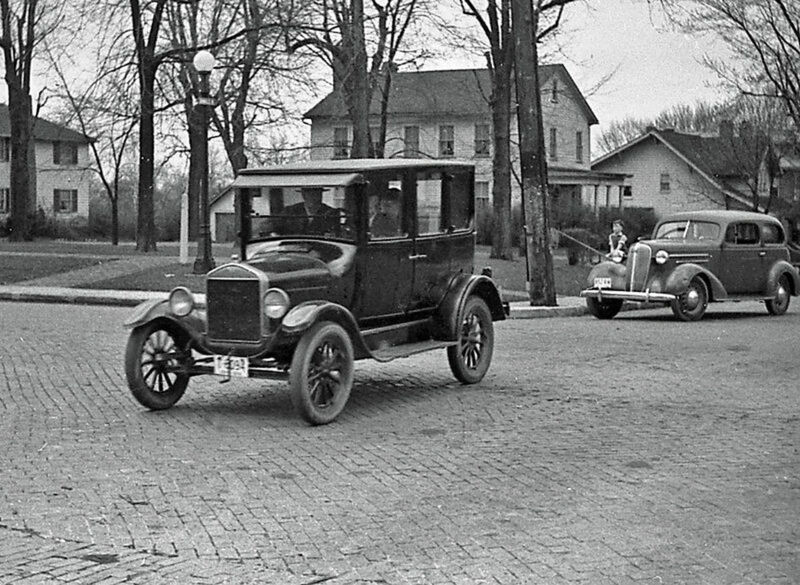 Do you think that in the first photo it might be a Packard automobile? Again...many thanks! My cousin to whom I have sent these pictures will be very interested in what you have found out regarding my grandfather driving a Brewster bodied automobile. Is it the first or second photo of him as the driver? Unfortunately there was nothing written on the back of the photos, so I cannot help you there. If you find out that it IS a Simplex auto, please let me know to which photo you are referring and thank you for your interest. Wishing you good results with your research and God Bless you also. Peggy, I have been researching Brewster & Company for the past 20 months throughout the Brewster Journals at the NYC Public Library. So, I was interested to see your grandfather's story and his connection to Brewster. There is a picture of him as a chauffeur and I can tell you that he is driving a Brewster bodied automobile. I believe it may be a Simplex, but am not certain. I've asked a friend and Simplex expert to give me his thoughts about the picture. I was wondering if there is anything written on the back of the photo. I do not find Mr. Eagle as having owned a Brewster bodied automobile, but the Brewster Journals are not complete. Thanks so much for sharing your grandfather's story. 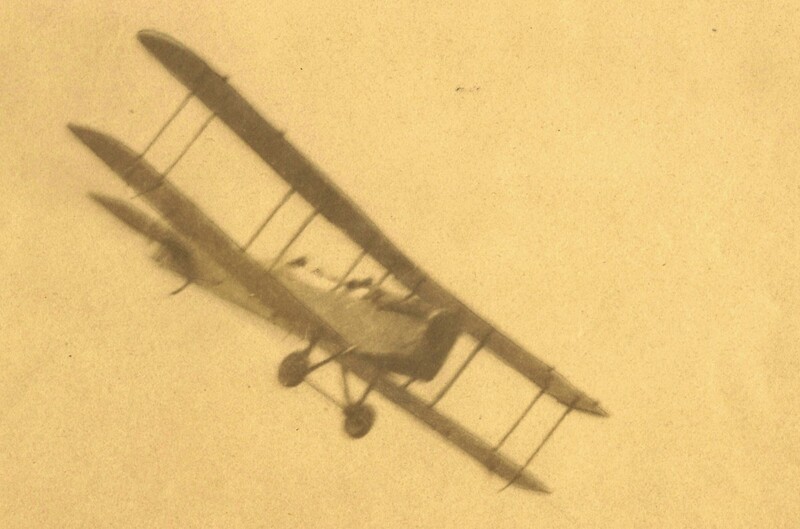 Thanks for visiting this hub regarding my grandfather and his experiences leading up to World War 1 and those early airplanes. Still wish I knew the details on how he met Charles Lindbergh. Appreciate your comment. Another true gem Peggy;you always put so much effort and care into your hubs Peggy and not one leaves me feeling flat. Great work again my friend and has to be awarded that up up and away !!!! It is true that my paternal grandfather packed many different experiences into his life and it is a shame that pneumonia caused his death just before my dad would have turned the age of 8. Penicillin had not yet been invented! Nice to know that you enjoyed reading this. Thanks for your comment. I love your stories about family history. This one was really interesting. Your grandfather was a very industrious and multi-faceted man! His life was full of adventure and doing what he loved-a great way to live. Thanks for sharing his story! Happy to hear that you enjoyed this look at the past seen through the lens of my grandfather's life. He certainly led an interesting one even if it was short lived. Thanks for your comment. Peggy, there is something I like about you. Your still keep the memorabilia in the past and you want to share this with us. I am glad to see the picture and all documents here. Thank you very much. Well done and rated up! Thanks for your visit and comment. Appreciate it as always. Wish I knew how and when my grandfather would have met Charles Lindbergh. Wow Peggy all your hubs are so interesting and this one is truly amazing. You always give your 100% and this one I am voting up up and away plus bookmarking. Take care Peggy and enjoy your day. I am glad that these letters, photos and memories were preserved. Hopefully they will be safe-guarded by other extended family members for years to come. Thanks for your comment. Oh Peggy. Another interesting and wonderful story of the life of your grandfather. It is amazing the collection of photos, letters and conversations you preserved from your grandmother and the fact that your grandfather was a private Chauffeur and that Charles Lindbergh played a role in your grandfather's life as well as many influential people. I truly honour members of families who collected great history for the future. Your hub will go into a historical library for sure. A marvelous memorable story of your grandfather. Great photos and videos. I suspect that you are correct and that is probably why my grandfather knew Lindbergh and got that photo of him as a gift. Too bad that it was not autographed! Thanks for your comment. This just proves that often we can still learn things about our older relatives whether we actually met them while alive or not. So glad that my grandmother had kept these old letters and photos and passed them on to me. I plan to make sure that they stay in the family! Thanks for your comment and do the research regarding your grandmother. You may be surprised at what you find out! I didn't know they had schools for chauffeurs back then.Because planes were not so common as now I suspect fliers were sort of like a club and tended to know each other.One does find out interesting things in family histories. This is a very interesting look at your grandfather’s life and history, Peggy. I’m generally not interested in cars, but your hub was definitely an exception! I enjoyed learning about the old cars and seeing them in the photos and video. You’ve tempted me to do research about my maternal grandmother, who died before I was born. She seems to have been a lovely lady and I’ve always regretted not knowing her. I am so happy to have been contacted by my first cousin's daughter who is working on Ancestry.com and together we are assembling photos and learning more about our family background. I intend to pass these documents on to them if they wish to have and preserve them since we do not have children. Thanks for your interest and comment. I did learn more about my grandfather by looking up those company names and learning the background information which made this even more interesting for me. Like you indicated, I had no idea that professional chauffeuring could bring in the kind of money that it obviously did back then. Actually I should have known that. My grandparents on my mother's side of the family at one time purchased what had been a chauffeur's home in Oconomowoc and it was huge! Thanks for your comment. You did a great job of bringing us into the past and personalizing it with awesome photos and documents. I've been working on my tree on Ancestry and have found there are many interesting stories lurking behind the names on those branches. Great job! Wow, this sure is an extra fine hub here. Never before seen vintage photos(even one with Lindbergh), the reference letters, the cool vids and of course your grandfathers history. Mr. Vogt led quite a life. Isn't something how the skilled art of chauffeuring could be enumerable enough back then to do what he was able to do. Awesome article and you must feel the same elation with these pics as I did with the old Carolina farm ones. My thoughts exactly! I had never even heard of these types of high end cars where people like the Vanderbilt's could choose a unique color and no one else could have it, etc. Thanks for your comment. These letters have been residing in an old cigar box and while I had read them many years ago, I did not realize their significance until I started looking up the different companies on the letterheads and realizing what they meant. Putting that together with a few lines recorded by my cousin interviewing my grandmother (many years ago) I learned much more. I never knew for instance that my grandfather had a home built in Pasadena, California. He must have had a good income to be able to afford that even back then! Nice to hear that you have found interesting things as well from your family history. Thanks for your comment. I really enjoyed your story. I once did our family tree and was fascinated by what I found out about the careers of many. PS Putting pen to paper really brings these story's to life doesn't it? I know what you mean. I wish I had asked for more information from my grandmother especially regarding the fact of how and why my grandfather knew Charles Lindbergh. At least these letters introduced me to more information about him and the times in which he lived. Thanks for your comment. You are very lucky to have some really fine memorabilia here. Thanks for sharing it. We all have those regrets about what we failed to ask before it was too late. Such is life. ...sigh.